The phorid fly is also known as the humpback fly and scuttle fly because it has to make a running start before takeoff. The family includes a species known as the coffin fly (Conicera tibialis) and the world’s smallest fly, Euryplatea nanaknihali. ⦁ Phorid flies are often confused with fruit flies (Drosophila) because of their size, but lack the latter’s distinctive red eyes. 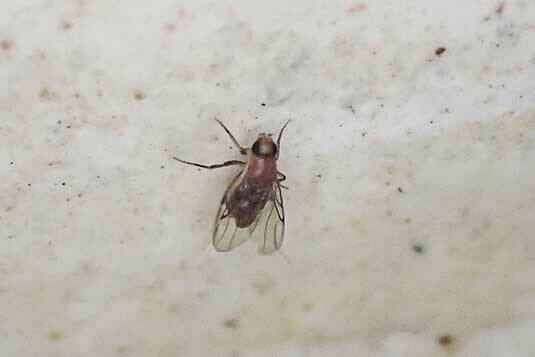 Phorid flies are characterized by a hump just behind their heads. ⦁ Phorids love moist, decaying garbage and organic materials found in drains, bathrooms, Dumpsters, compost heaps and human corpses. 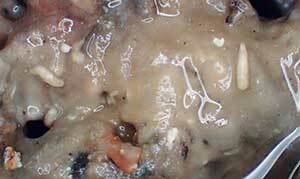 ⦁ Some phorid flies are harmful. In January 2012, for example, a group of researchers connected Apocephalus borealis, a phorid that attacks honeybees, to colony collapse disorder (CCD). You can reach Kate and Jeff McGovern at jeffreymcgovern@mindspring.com. Note the fly larvae of future generations visible in the funk. - Why do vinegar flies love onions?